This is a Fluorescent fixture located in the digital lab. This fixture provides ambient lighting. The Luminaire contains one fluorescent bulb to illuminate the space. 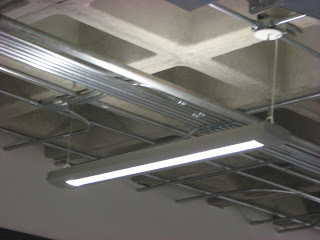 This light source provide bright light conducive to working in a space. The fluorescent fixture brings out the white in colors. I feel that a bright light is needed in areas where work is completed. Yet this fixture can also create visual fatigue and head aches.